Social Studies Unit - Welcome to Room 23! This year, students in Washington State will study the first nations of North America. 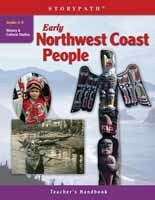 The students of room 23 will have the unique opportunity to study the early Northwest Coast people through the engaging curriculum of Storypath. During our unit of study, students will bring history to life. By creating a real setting and taking on characters, we will come to know the early people and environment of Washington State in-depth. Students will then experience critical incidents (such as the arrival of traders and new settlers) that prompt critical-thinking and problem-solving skills. The story will end with a traditional ceremony of the Northwest Coast people. Research tells us that "children learn best when they are active participants in their own learning," (McGuire, 2006, p. 2). We believe the Storypath approach will provide a rich context for learning.